The complete list of Emmy nominations has been posted and like last year, the awards prove that if you're an actress over 40 looking for a meaty dramatic role, you'll have better luck on the small screen. What Do You Think Of The Women&apos;s Roles Nominated For Emmy Awards? 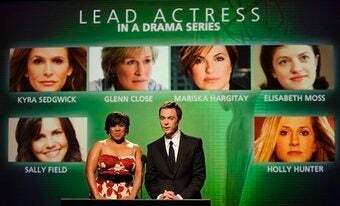 About 70% of the actresses nominated for an Emmy for a dramatic role were over 40, compared to 40% of the actresses nominated for Academy Awards. A fairly diverse group of women were nominated for Oscars this year, but Meryl Streep was still the only actress over 50 nominated. There were many more Emmy nominees of course, but it seems even women over 50 mainly known as film actors are having an easier time finding juicy roles on TV these days. Sally Field, Glenn Close, Holly Hunter, Shirley MacLaine, Jessica Lange, Sigourney Weaver, and Dianne Wiest are all over 50 and were nominated for Emmys this year. Many of the older actresses nominated were featured in programs on cable, and one of the most notable things about this year's list of nominees is how cable shows dominated network shows in major categories. House and Lost were the only two network shows nominated for Outstanding Drama Series. Plus, AMC's Mad Men was nominated in 16 categories, the most for a dramatic series (though it was second to NBC's 30 Rock, which had 22 nods). There were still plenty of snubs even among the cable shows. For True Blood and Battlestar Galactica, the tinge of sci-fi disqualified them from the Emmy race. No special consideration was given to shows that aired their final season, such as Boston Legal, ER, The Shield, Pushing Daisies, and once again, Battlestar Galactica [as they'd say on BSG, frak]. According to the comments in our previous nominations post, many of you are also upset that Friday Night Lights was snubbed. Are you saying you don't find the show's lone nomination for Outstanding Casting For A Drama Series satisfying? Below are the nominations for this year's Emmys. The complete list can be found here. Earlier: What Do You Think Of The Women's Roles Nominated For Emmy Awards?